With remarkable virtuosity and intensity, Roussev performs a broad repertoire ranging from the baroque to the contemporary. He is renowned for his renditions of Slavic compositions and keenly promotes Bulgarian music. Acclaimed Bulgarian Musician of the Year in 2006, his home country honoured him yet again in 2007 with the Cristal Lyra distinction awarded by the Ministry of Culture. Roussev is a regular guest soloist with various orchestras such as the Orchestre National de France, Orchestre Philharmonique de Radio France, Seoul Philharmonic Orchestra, Tokyo Philharmonic Orchestra, Sendai Philharmonic Orchestra, Indianapolis Symphony Orchestra, George Enescu Philharmonic Orchestra (Bucharest), Romanian National Radio Orchestra, Bulgarian National Radio and Symphony Orchestras, Presidential Symphony Orchestra (Ankara), and the Johannesburg Philharmonic Orchestra. In the USA, Latin America, Asia and Europe Roussev has performed under the baton of conductors such as Myung-Whun Chung, Leon Fleisher, Yehudi Menuhin, Yuzo Toyama, Marek Janowski, Raymond Leppard, John Axelrod, François-Xavier Roth, Jean-Jacques Kantorow, Denis Russel-Davies, Lionel Bringuier, Leo Hussain, Nicholas Milton and Emil Tabakov. Roussev has played in many of the world’s major concert halls, including the Bolshoi Theatre, Suntory Hall, Sumida Triphony Hall, Seoul Arts Center, Salle Pleyel, UNESCO, Théâtre des Champs Elysées, Théâtre du Châtelet, Cité de la Musique, Théâtre de la Ville, Arsenal de Metz, Halle aux Grains de Toulouse, Bulgaria Concert Hall, Budapest Béla Bartók National Concert Hall, Frankfurt’s Alte Oper and the Palais des Beaux Arts de Bruxelles. Roussev shares his love for music with an ever-widening public through his chamber music performances, playing with partners such as Myung-Whun Chung, Peter Frankl, Ralph Gothoni, Jean-Marc Luisada, Bertrand Chamayou, Jean-Philippe Collard, Antoine Tamestit, Lise Berthaud, Vladimir Mendelssohn, Maxim Rysanov, Gary Hoffman, Arto Noras, Sung-Won Yang, Young-Hoon Song, Jian Wang, Myung-Wha Chung, François Leleux, Paul Meyer, Nikolaj Znaider. He is a founding member of the Roussev-Salque-Rozanova Trio. Following his successful CD recording of pieces by Pancho Vladigerov with the pianist Elena Rozanova, Roussev brought out his recording of Karl Amadeus Hartmann’s Concerto Funèbre with the Orchestre d’Auvergne conducted by Arie Van Beek,recordings for French labels Integral and Fondamenta dedicated to the Franco-Belgian school of violin with pianist Elena Rozanova, and sonatas by Grieg and Medtner with pianist Frédéric D’Oria-Nicolas. Roussev is the concertmaster of the Radio France Philharmonic Orchestra and, since 2007, has been concertmaster of the Seoul Philharmonic Orchestra. 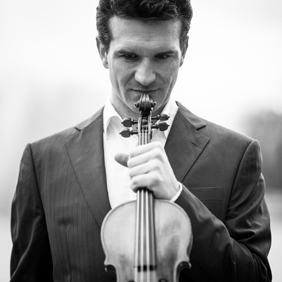 He is violin professor at his alma mater, the Conservatoire National Supérieur de Musique et de Danse de Paris.